This time we focussed on two talented guys from the Netherlands who recently had some really good releases out there so we thought it would be nice to feature Disfunktion on toblip.com. Hi everybody, we are Barteld Frech and Mike Tielemans, two guys from The Netherlands, producing and dj’ing together as Disfunktion. 2) toblip.com: How long are you into music production right now and when have you decided to make music? Did you maybe learn to play an instrument when you were children? We have been friends for almost 15 years now. We started out playing at school parties and local bars for fun and beers. Only a few years ago we started messing around with Ableton Live, also just for fun. We were totally new to this, so we started with sampling discosongs. We were (and still are) a big fan of Olav Basoski’s tracks and remixes. So during that period we made a lot of filterdiscostuff. When we listen to it now it’s very bad hahaha. But one track just worked for us and luckily for Olav as well, cause he signed it to his label Rootz (although he totally did the mastering and Eq’ing, it needed that for sure haha, thanks O ;-)). We were also in the process of finding a style and technique we felt comfortable with! Since more than a year or so we are really happy with our sound and productions. We switched to Logic and some external stuff and everything fell into place! 3) toblip.com: While checking out your soundcloud to find out more tracks you have done I actually found out that you can do a variety of tracks. Your remix of “Myth” by Hard Rock Sofa btw. is a bit harder, “Snooki” is a trancy track and “Lost all the way” is an amazing progressive house track. Do you have a favourite genre or is it more that and idea comes to your mind and you just start and don’t think about how it turns out? We just start with a hook in Logic, which sometimes is very bigroom trancy and sometimes is really clubby and melodic. We just go from there and see how it works out. Sometimes it turns in something completely different :). We like a lot of styles, as long as it has a good melody and a nice drop. Luckily we are signed to PinkStar Records, they are open to a lot of our ideas. We produce with a certain set of kicks, hats etc etc, which we sculped in the last year. So even if the styles are different we hope there still is some sort of red line in our latest work. 4) toblip.com: Of course you did some track with vocals like “In The Sunshine” with Max C, “Lost all the way” or your latest track “Chasing the clouds”. How do you think about vocals? Do they support the vibe of a track you want to spread or do you think that they are sometimes just necessary to make a track sound more finished and complete? 5) toblip.com: Some weeks ago I found this “Avicii” track on youtube and I found out that it was just one of those fake uploads. The track now has more than 3 million views and actually it is “Galette” which is a production you made. Is that something positive for you that a lot of people might like it or do you dislike it as your work was “wrong” promoted by titling it as an Avicii track? So hopefully this video will introduce a new group of people to Disfunktion and discover our music. 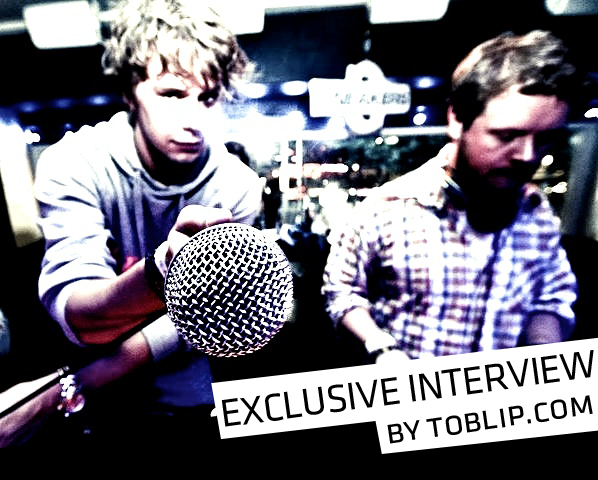 6)toblip.com: Can you tell us something about your upcoming tracks? On what kind of tracks are you working on at the moment and when will they be out (if already planned)? At the moment we are spending a lot of time in the studio! We have around 20 tracks or so waiting for release. These tracks are in the style of our recent tracks, so a lot of piano’s, some vocals and also a lot of harder stuff! We are working on an album (to be released on PinkStar somewhere in the new year, more info soon) As mentioned earlier there will be a massive new release coming up with Max’C in the beginning of 2012! 7) toblip.com: Talking about your work with what kind of equipment do you work? Any favourite software or plug-ins you think that are necessary for the hardworking and upcoming producers out there? As we mentioned, we made the switch to Logic. So we use Logic’s plugins. We are big fans of Sylenth1, Nexus, KorgM1, Sampletank for making melodies. For sculpting the sounds we use some Waves plugins and a lot of Logic EQ’ing. Other great plugins are BBE Sonic Maximizer, QuikQuak Reverb and SPL Vitalizer. These clean up the sound a lot. And we also invested in some hardware, we use the SSL XLogic BusCompressor in our Master Chain. 8) toblip.com: Besides producing you are also deejaying. What was your best experience so far? Do you have a resident club and where would you like to play? Last year we went to the Miami Winter Music Conference for the first time, which was just amazing! We played at a couple of venues including a very nice poolparty at a luxurious hotel right off the miami beachfront. It’s just so cool to see people in the U.S. going crazy over your productions, especially while you’re in the miami sunshine during your gig. The best gig however must have been Nikki Beach Miami that same week. We spent all day there, and ended up doing a 2,5 hour set and finishing the party. Just amazing to get so much love from the crowd! We don’t have a resident club anywhere, but we’ll be in Switzerland in january, in Sweden in february and we’ve allready confirmed Nikki Beach Miami in march! We’re looking forward to this a lot! 9) toblip.com: The electronic dance music scene is growing and growing. DJs are – somehow – the new rockstars e.g. Swedish House Mafia who just played at Madison Square Garden. What do you think about the development and what do you think will happen to EDM in the future? We feel that the the dj/rockstars like SHM are just killing it on so many levels. We’ve playing out stuff from Steve Angello and Axwell from back when they made disco/funk records. To see where they took EDM in the last couple of years is just impressive, to say the least. Tiesto recently even came out with his own clothing line! We hope that EDM will continue to grow and take advantage of the respect that everyone has for the style of music. We’ve known this music is awesome for quite some time, it’s just nice to see the rest of the world is coming to that conclusion also! 10) toblip.com: As the year is almost over what are your goals or your intentions for 2012? We hope to gain more fans, get more gigs and sell more records! We’ve got so much tracks, remixes and bootlegs coming out in the next couple of months, including our upcoming album. We feel very positive about the coming year and are looking forward to it a lot! 11) Last but not least. What are your top 5 favourite at the moment and your top 5 all time classics. 12) Thanks a lot for doing this interview. Of course we will keep an eye on you and your work and wish you all the best. You are very welcome! If you want to stay up to date on our music and gigs follow us on soundcloud: http://soundcloud.com/realdisfunktion or on http:// twitter.com/RealDisfunktion.